At right, a Diason practice amp utilising a single EL84 in pure class 'A' producing 12 watts RMS of shear warmth. 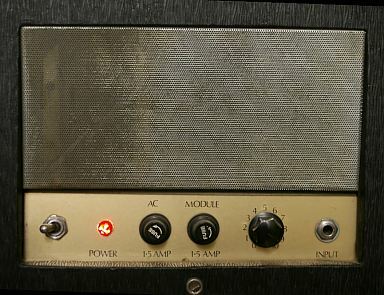 The identical amp was also marketed under the 'Maton' badge with super-cute checked tolite covering. Unfortunately the previous owner did the '70's makeover on it and pulled the vinyl trim off - tragic. The original speakers were are 2 x 8 inch Rola 15 ohm types which unfortunately I have had to replace. If I come buy some others I will get them re-coned and put these back in because they are miles better than generic types. The old Aussie Rola loudspeakers had a very warm sound. 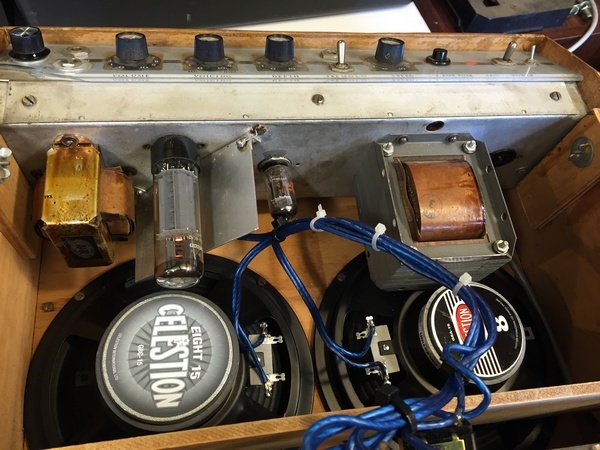 If you're thinking of throwing out that old valve amp in favor of a new one, think again ... it may have a unique sound which can't be matched by today's corporate electronics product. Providing the transformers are O.K., I can fix it up, and probably even improve it for you. 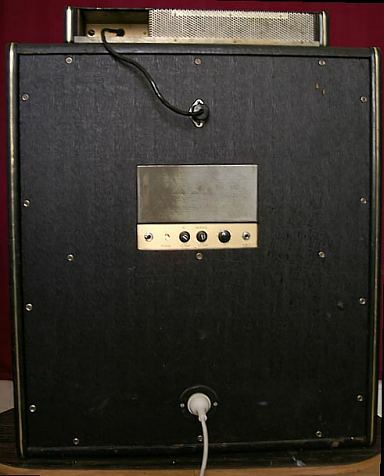 On the other hand it may be a piece of junk like many of the '60s Australian efforts at guitar amps. Often they didn't stack up because they were built with cheap valve sockets that give reliability problems, inferior paper caps, below par audio transformers and boring circuits that tended to be based on valve public address amps using weird valves like the 6DQ6 horizontal outputs from a TV as the power section (ouch, awful sound). Capacitors can be changed and upgraded of course, but if the raw material is ordinary, it can stonewall. However, some were good and very cute - like the 'Goldentone' range, and some of the 'Diason's. 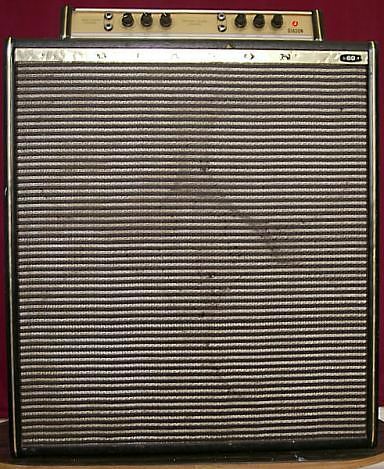 They fill a niche sound category these days, since many of them were cathode biased class 'A' circuits - a bit like a Vox AC30. The Goldentones were very clean and great for '50s R&R. The Diasons as warm as toast. Also included in the mods are a low power switch (far right) which cuts down the HT by a series resistor bank, and reduces the power to about half a watt, and a variable negative feedback control (far left) on the output section which varies from no feedback at all to almost unity gain. The more FB is applied, the smoother (and duller) the sound gets. Now with two 8" Celestions - getting pretty crowded but sounds so good and is loud enough to play with a drummer. At right the (non-Australian of course) 1963 Fender Concert again in first class condition for it's age. It has the original 4 x 10"/8 ohm Celestion cone loudspeakers which came as standard. 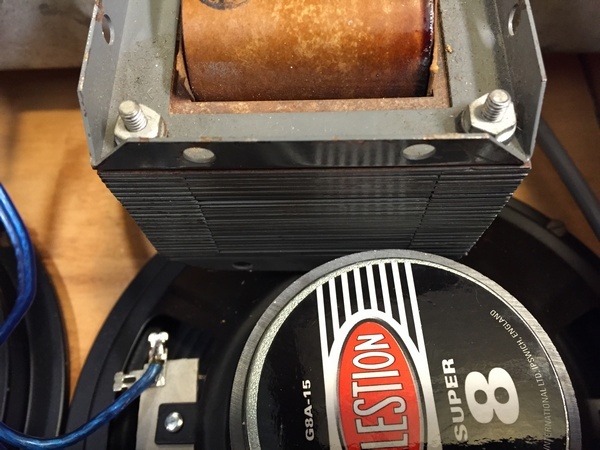 The story goes that the ever pragmatic Leo Fender custom ordered a big shipment of the speakers from Celestion, and then crafted this model to use them up. The speakers look like Fender drive units superficially, but use Celestion cones and magnets. They run in parallel giving a load of just 2 ohms! The result was spot on. In the '80s, all these people were spraying their guitars and basses with hideous pink colours designed to imitate the faded look of 'fiesta red'. The result was awful, and looked nothing like the real thing. Simplicity paid off for me....................and the sound of this guitar is right on the money, it's one of the best sounding Strats I've heard. Totally the real deal. This is the guitar I play in the band 'Guitars of Love'. 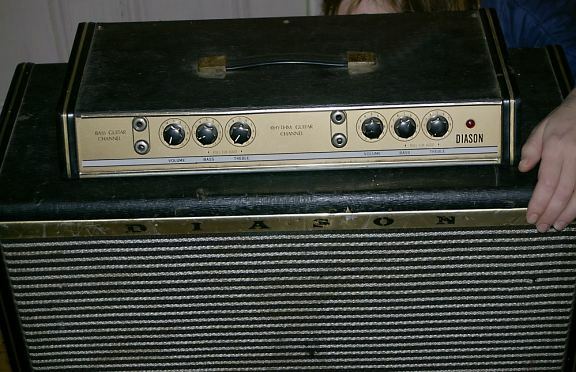 Below, a Diason combo, (pics supplied by Luke Walker) utilising the uniquely Australian idea of separating the power section of the amp from the low level pre-amp/tone control sections. The power supply and power amp module is in the main speaker cabinet, with a multpin cable to the top pre-amp head "break-out" unit. Why they went to all the trouble doing this is a mystery - perhaps trying to keep the weight down, or keeping hum and noise down by keeping the signal parts away from the hum and buzz of the high power tubes and transformers. I doubt it the effectiveness of this. More likely it was done to keep microphonics induced by speaker vibrations to a minimum. It must have surely added extra cost with the cables and plugs etc. It does sometimes allow easier servicing however if there is a fault with the pre circuitry.